Resilience building has become an increased priority for the Ethiopian government and also for development partners present in the country. Building resilience means that communities affected by drought, floods or other shocks are supported to sustain and recover from these shocks through improved livelihood opportunities, better food security, and access to services, including social protection. 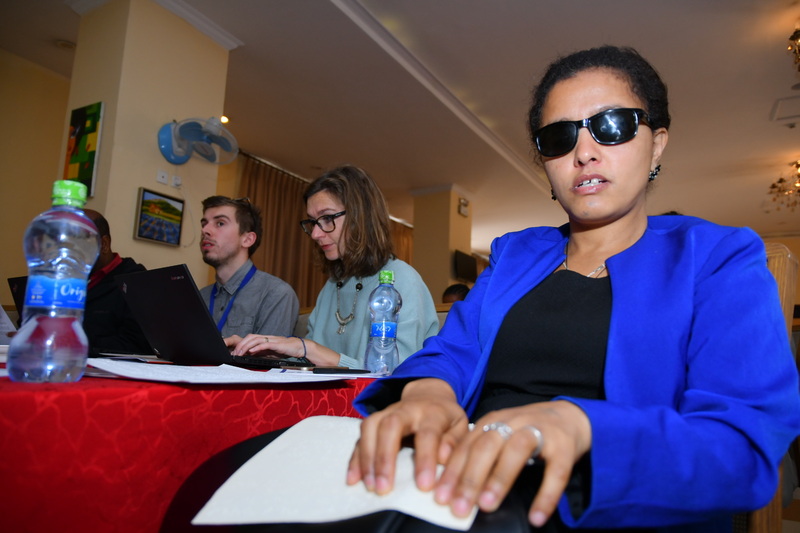 As disability inclusion has not been much discussed or addressed on the resilience building agenda, Bridging the Gap (or BtG) in Ethiopia decided to focus on this sector to support inclusion in livelihood and social protection interventions. BtG II’s chose a project strategy is to work through already existing resilience building programmes by supporting these programmes to become more disability inclusive. These programmes are implemented in the Amhara and Somali regions of Ethiopia, which are the target regions for BtG. These programmes are being implemented by organisations such as CARE, Action Against Hunger, Oxfam, UNDP and many others in close collaboration with the local government and with funding from development partners such as the European Union and the Austrian Development Agency and others. The strength of this approach is in that it reaches out to mainstream programmes and the actors implementing them and provides them with support to become better aware of the challenges people with disabilities face and to become more inclusive in their programmes. Through this approach BtG fills the gap in awareness of understanding the human rights approach to disability and the gap of technical skills and knowledge to practise inclusion on the ground. BtG works with the programmes through awareness raising and through technical training and regular follow-up and support for inclusion. Working with many different actors also gives the BtG team joy and motivation. This is especially the case when an organisation openly acknowledges that they are not doing enough for disability inclusion but warmly welcome BtGs support to help them change their practise. In fact, this has been witnessed already with several organisations and it shows that many now are ready to work for inclusion. With the words of one head of programmes upon meeting with BtG and hearing what the BtG team can offer: “I am smiling here like a monkey because you come exactly at the right time”. It is these “open windows” that give the team the extra spark and motivation, especially as every team member know from experience that these “windows” more often have remained closed in the past. The key counterpart for BtG in the government is the Ministry of Labour and Social Affairs (MoLSA) and their bureaus in the regions. Through MoLSA BtG also reaches out to other sectors involved in resilience building such as food security, water and agriculture and women affairs. Through work with the targeted programmes BtG aims at influencing the communities as a whole, by including the sectoral government bureau staff in the trainings and through them reaching out to the communities and their leaders. Alongside changing the attitudes and practise BtG will support the local disabled persons organisations in the targeted communities to become stronger and to become accepted members in their communities and to contribute to inclusion and development of their societies. The approach in other words aims to be comprehensive by involving all actors on the ground. While this is the excitement and promise for more sustained results it also poses challenges in that there are multiple actors to follow-up with. However, this is what the BtG team is here for and in course of the project time we hope to see some ground-breaking changes within a handful of organisations and communities in terms of inclusion.